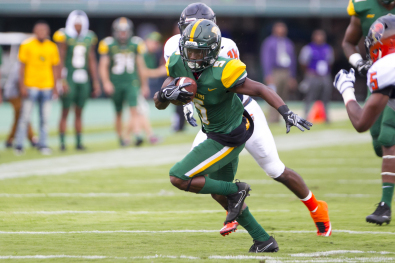 The 2017 Labor Day Classic will go down in Norfolk State history as a bittersweet loss and victory to longtime rival Virginia State University. The Trojans beat the Spartans 14-10 on the gridiron, but in the Battle of the States, the first-ever fundraising challenge between the two HBCUs, Norfolk State was victorious. NSU raised $316,866 from 609 donors in the week-long Battle of the States. Among the many NSU donors in the Battle of the States, the members of Pi Gamma Alumni Chapter of Omega Psi Phi raised $3,000 in 30 minutes during a celebration of the chapter’s 55th Anniversary at Norfolk State University. Their donation was part of the grand total raised during the Labor Day Classic Battle of the States fundraising competition. Virginia State University raised $91,000. Athletics, Student Activities, Alumni Relations and other campus departments scheduled a plethora of activities for alumni, friends, students and others for the weekend. Highlights included events like a casino night, the Battle of the Bands, a street festival, a football workshop for women, tailgating of course and more. Best Labor Day Classic ever! And the first meetup of the two rivals since 2012. Tags: Battle of the States, HBCU, Labor Day Classic, Norfolk State, NSU, Spartans, Trojans, Virginia, VSU. Bookmark the permalink. Mos Def on retirement: "I'm always going to be creating"